The Palisades American Bitter (a British-style bitter malt profile with 100% Palisades hops and fermented with Wyeast 1056 American Ale yeast) has completed fermentation and bottled-conditioning. Starting at 1.033, this ale finished fermentation down to 1.008, attenuating around 75%. Fermenting around 66 F, 1056 showed typical characteristics of West-coast ale strains, taking close to a month for the yeast to drop. After primary, I transfer this batch to bottle (as I normally do), primed with 54 grams of corn sugar, yielding 24 bottles (remember, this is small batch brewing). Since this is a light, sessionable ale, I plan to drink this one fresh, and keep a few around to see how the flavors change over time, specifically the flavors and aromas of the Palisade Hops. 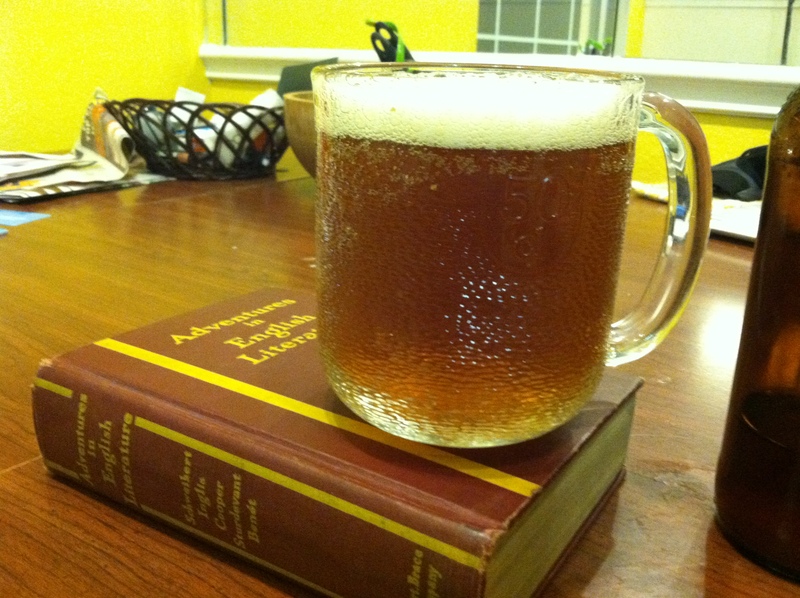 Appearance Pouring into a half-liter glass tankard, the Palisades American Bitter has a orange, copper color, only slightly lighter than typical English bitters. This may be because this beer had a slight haziness due to yeast in suspension, making the overall appearance slightly lighter. 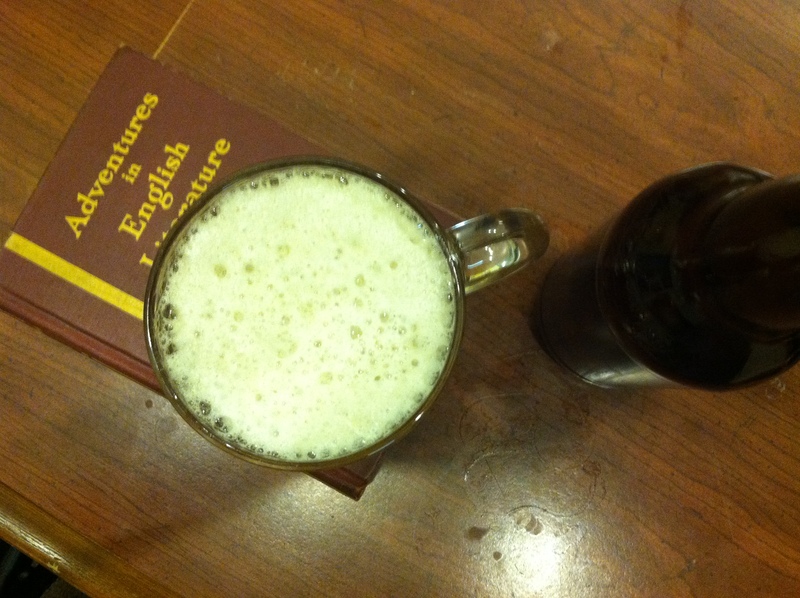 Also, the head from a standard pour was white in color with a loose, foamy head, much like London cask ale, pulled without a sparkler. Aroma In sniffing this beer, the aroma was slightly unexpected. From my analysis, I perceived the expected the moderate earthy, herbal, slightly fruity hop aroma from the palisade hops. Additionally, I pick up considerable citrus-y character in the aroma, close to a lemon peel. Since the palisade hops are known not to have a citrus component in its aromatics, I determined it was likely in part to the yeast fermentation. My expectations with the Wyeast 1056 American Ale strain was a fairly clean/neutral fermentation profile with little ester. However, upon doing some research, I discover from wyeastlabs.com that the American Ale strain actually puts off “mild citrus notes” at cooler fermentation temperatures, approximately below 66 F (around my fermentation temperature for this ale). I have in previous batches used this strain at low temperatures and never perceived this ester in the aroma or flavor. However, given the lighter malt and hop profile of this ale, the citrus ester really popped in the aroma. Taste Very similar to the aroma in this one. Mostly an earthy, herbal hop flavor with some of that citrus ester hanging around. Noticeable bitterness. Additionally, some low malt, toasty in nature was detectable, enough to balance out the bitterness of the hops. Mouthfeel For a bitter-style ale, it had medium-low carbonation. With such low starting and finishing gravities, it had a light body (ideal for a session-style ale). However, the overall flavor and aroma kept this beer from being perceived as thin. Opinion Overall, this achieved the goal of being a very sessionable ale. This batch disappeared pretty quickly (by the end of April). The low body and low carbonation made it very drinkable, while the hops kept the flavor from becoming boring or bland. I was quite surprised with the citrus notes arising from the 1056 fermentation. I would definitely try making this recipe again, only changing the yeast strain to something like Wyeast 1098 British Ale to see if the citrus notes disappear completely. Check out the attached brewer notes for my specific brew day info. Thanks for reading! Cheers!